April Activities…Better Late Than Never! Hi everyone, sorry I’ve been absent for a while but I’m getting ready for some major changes. Anyways, here are some ideas and activities for the month of April. Better late than never! April is such a beautiful month and its holidays are all about keeping it that way. First, April is “Keep America Beautiful” month and “National Volunteer” month. It also includes the special days of Easter (4/24) and Earth Day (4/22). You may want to start with your classroom here. Having a beautiful environment for you and your students can help with your mood therefore leading to doing better work and better attitudes. Remember it is also spring cleaning time so now is the best time to do so by de-cluttering and organizing. This has other great benefits too such as cutting down on your work at the end of the school year. You can encourage your students to clean up their rooms, homes, and communities as well and take before and after pictures to bring in and share with the class. You can also pick a day to take students around the school campus to pick up litter, take down old signs and posters and wash places that may not be cleaned on a regular basis. They may also design and create new signs/posters encouraging students to keep their school beautiful. What is a greater feeling than helping someone in need or informing the uninformed? Nothing, this experience is PRICELESS!!! This month you have options for encouraging your students and others to volunteer. You could also require your students or encourage them to obtain a certain amount of volunteer hours during this month. They may volunteer at nursing homes, to help teachers, day cares, youth centers, etc. You can recognize everyone with a certificate and give a gift for the most outstanding one or not. However, the reward of the effect they have on the ones they have helped should be enough! Visit www.dosomething.org for more ideas! If you don’t have a refrigerator that dispenses filtered cold water, how about purchasing a water filter for one of your sinks and encourage students to bring reusable water bottles to fill. This also has added benefits of cutting down on hall passes to the water fountain. 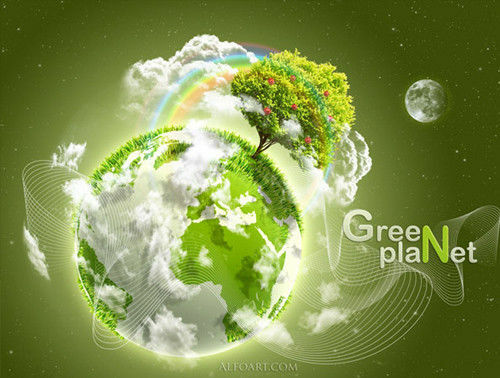 You can find more green projects here! Hope this gets you motivated, have an Awesome April!! !